It will be father’s day on Sunday June 17th in the UK. Are you ready? Do you have your dad’s present sorted out, or have you taken your kids shopping for their dad’s present(s)? I’ve been giving some thought to what would make a great Father’s Day meal and I thought that it’s not just women that enjoy a special breakfast, especially if their partner and/or kids bring it to them in bed as a special treat! So that got me thinking about what would make a breakfast truly special, and I immediately thought about delicious juicy scrambled eggs, scrambled in oodles of butter and topped with smoked salmon & dill. Scrumptious! The eggs literally take SECONDS to scramble, so make sure you have everything else ready, including a plate to serve them on, your chopped salmon & dill and any toast you might be serving the scrambled eggs with! Crack the eggs into a bowl and lightly season with salt & pepper, to taste. Whisk them with a fork, not a lot, just enough to break up the yolks. Over-worked eggs are not nice to eat! Place the butter in a small non-stick frying pan. Turn the heat on high and as soon as the butter starts sizzling, pour in the eggs. Keep the heat on high and keep stirring with a wooden spoon/spatula so that you don’t end up with an omelette. The process will literally take about 20 seconds, depending on how moist you like your scrambled eggs (I think they’re best served really juicy and barely cooked!). Remember they’ll keep cooking once you turn off the heat as the pan will still be hot, so get them out of the pan and onto a plate as quickly as possible! 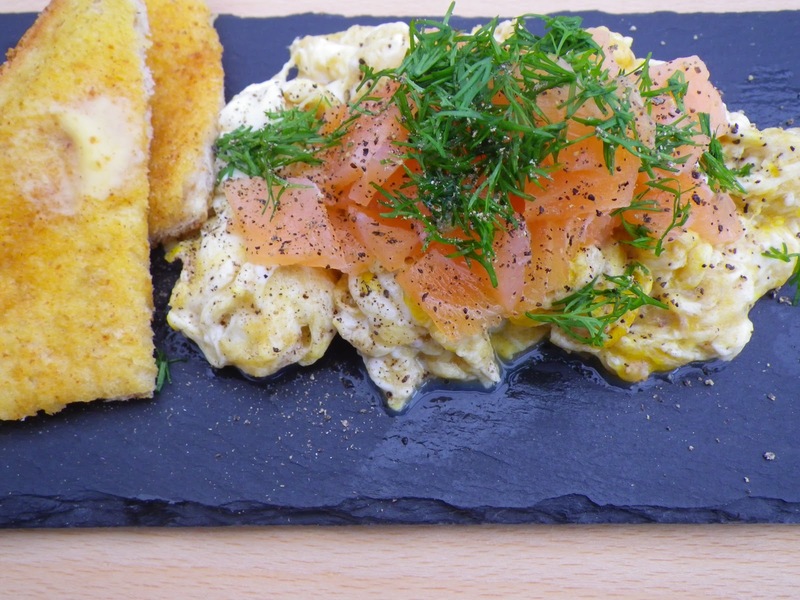 Place the scrambled eggs onto a plate, top with chopped smoked salmon & chopped dill, sprinkle on some more freshly-ground black pepper, to taste, and serve with your (or your dad’s/husband’s/boyfriend’s) favourite buttered toast. Mmmmmm – Gloriously Simple, Gloriously Good! 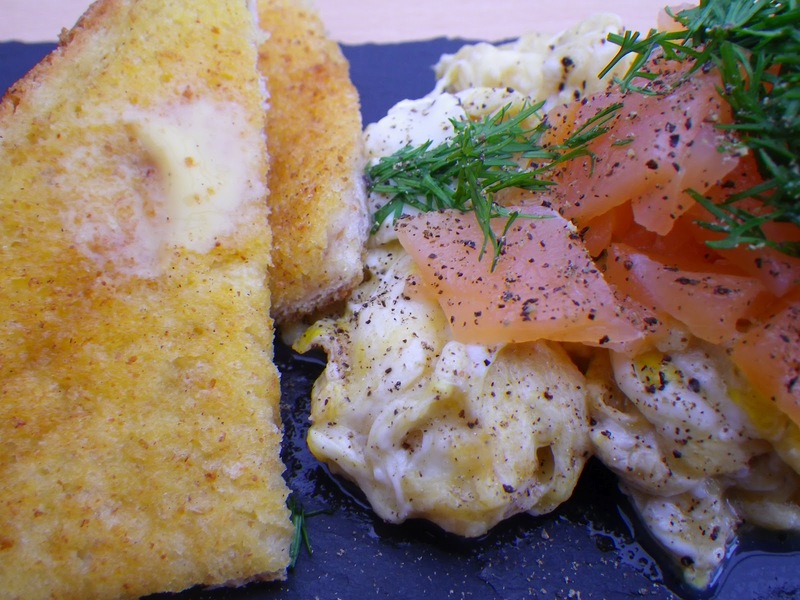 This entry was posted in Breakfast, Dairy & Eggs, Fish / Seafood and tagged breakfast, butter, dill, eggs, fathers' day, salmon, scrambled eggs, scrambled eggs with smoked salmon and dill, smoked salmon. Bookmark the permalink.